It’s almost time for the kids to go back to school. From uniforms to stationery to lunch, prepping for term time can be stressful - and expensive. But not to worry! We’ve put together some nifty ideas to help you sort the kids this September - without breaking the bank. Before heading to the shops, do a sweep of the house to see what you’ve already got leftover from last year. It’s easy to end up with extra pencils, rubbers, and notebooks, so take a look around to see what you can use this year. Of course, depending on how old your kids are and what they’re studying, they might need more stuff, like art supplies, sportswear, and textbooks, as well. After searching your house, be sure to check online for deals before heading out to the shops. Uniforms can often get pricey, but there are easy ways to save some money on them. Whilst some items might need to be bought from the school shop, like anything with an embroidered logo, some schools do offer patches of the logo as well. You could sew patches onto generic jumpers and blazers instead to save a pretty penny. For generic items like skirts, shirts, trousers, and shoes, shop around for deals. Aldi and George at Asda often do popular schoolwear ranges because they offer low prices on well-made clothes. School uniforms often end up battered and torn anyway - especially with the little ones and the footballers! - so prepare for the inevitable by grabbing duplicate items for less. When buying stationery and art supplies, try to buy in bulk or aim for multipacks which frequently offer better value for money. Multipacks can be cheaper overall - and most stationery doesn’t expire! So anything your kids don’t use this year will still be helpful next year. For affordable stationery, check out places like Wilko and big supermarkets. These are good for everyday supplies like pens, pencils, and notebooks. For more specialist equipment, shop around online to see if you can find a good deal. School supplies are often branded, especially when it comes to bags, pencil cases, and stationery. Whilst this stuff is designed to appeal to kids and teens, it tends to be much pricier and often lesser quality than non-branded kit. Teaching kids about the value of money from a young age will help you to convince them to compromise! And if they really want that backpack with their favourite popstar’s face or their football team on it, do some digging for deals. Of course, branded items aren’t the only way for your kids to showcase their personalities. Customising generic bags, cases, and notebooks are a more cost-effective and unique way to reflect your kids’ tastes and interests. Get your kids to use stickers, patches, doodles, and printing to DIY their kit and make it truly their own. You can guarantee nobody else at school will have the same stuff, and this is a wonderful way for your kids to express their creativity. Packed lunches can be a great way to save money and help your kids to eat right. It might not be realistic to aim for a packed lunch every day, depending on your circumstances, but even one lunch a week can make a real difference to your wallet. If you make lunch for yourself for work, think about making something your kids would like too. Increasing portion size could save a lot of time and energy when preparing lunches. Aim for a healthy balance too - packed lunches can offer peace of mind, knowing that your kids are getting a good meal. 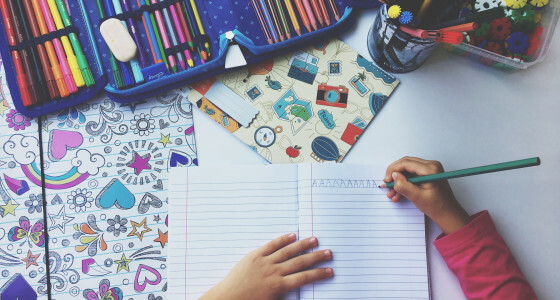 Getting the kids ready for school can be a stressful whirlwind of a time, but with a bit of preparation, it doesn’t have to be a nightmare - and you could even save a small fortune too! Do you have any tips for sending your kids back to school on a budget? Let us know in the comments!